Small clutch and boho/Ibiza bracelet. Last week I didn't get my design for a small envelop/clutch style wallet ready. I didn't want to make it out of one piece, because then I need a big piece of leather and I have much waste. So I figured something out in 3 pieces, measured and fixed it all out and made it out of paper: the corners overlapped each other too much to my taste/opinion and I made a new paper template with the corners 1 cm shorter and that looked good to me. I traced the pattern over on the leather, cut the pieces out and started assembling it: hadn't I shortened the corners! When designing, I hadn't taken the thickness of the leather into account and now I had to pull and tug and wrick the flaps into place. To close the envelop I had a stud in mind, I fixed the stud but the closing flap was also too short; I didn't want to make the incisions to pass the stud through out of fear the flap wouldn't close properly, so I decided on a nice red elastic to be hooked around the stud. Of course this is only a prototype, but despite the minor problems it looks good and attractive. With some minor adjustments, I'll have a good pattern and my own! LoveLea's small leather clutch in firm black leather. Here comes the bracelet in dark brown leather I was talking about in my last post: (https://hildemariapierredenys.blogspot.com.tr/2017/11/small-leather-goods-ibiza-style-jewels.html). LoveLea's bracelet in dark brown leather with shells boho style. The shells I used are vintage, I have them for at least 40 years. Wear this bracelet in summertime, when you are longing for the summer, at a beach party. It will make you feel happy and sunny. In a week we will be leaving our summerhouse and going north. 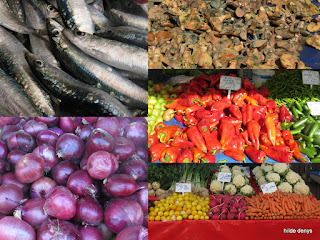 When we went to the market to make our last shopping, I took my camera with me to shoot some pictures. 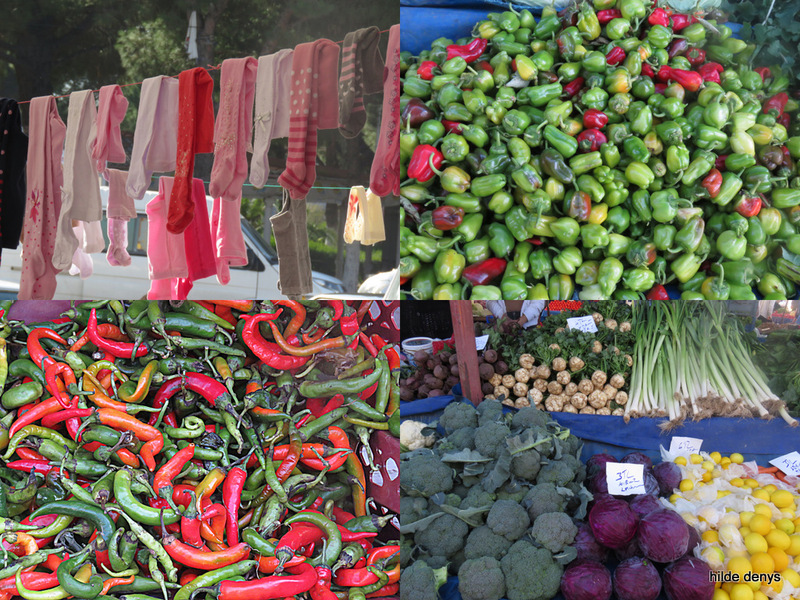 It was difficult to choose a picture thus I made 2 collages and you have an idea what the colorful market is about. 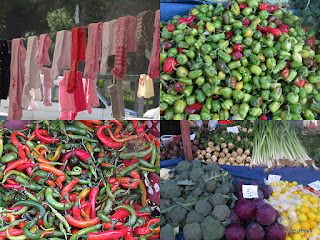 Socks and vegetables at the local market. since a couple of days, a stray cat visits our garden. He is yellow and shy. Tuesday he was wading through a layer of dry leaves, about 5 cm high, really slowly, 1 path at the time, his tail waggling and moving up and down and right and left, no sound coming from the dry leaves. I was in awe for this skill but the waving of his tail puzzled me. I stood still, watching him and wondering what he was up to: had he spied an insect? a wounded bird ? then all of a sudden a big scream, my hart almost jumped out of my chest, and another cat leaped out from under the leaves, a gray one with his fur all mixed up and ugly, unclean. and unkempt. Off they went chasing each other. The clever cat had hid in a depression of the earth full of leaves and was invisible. 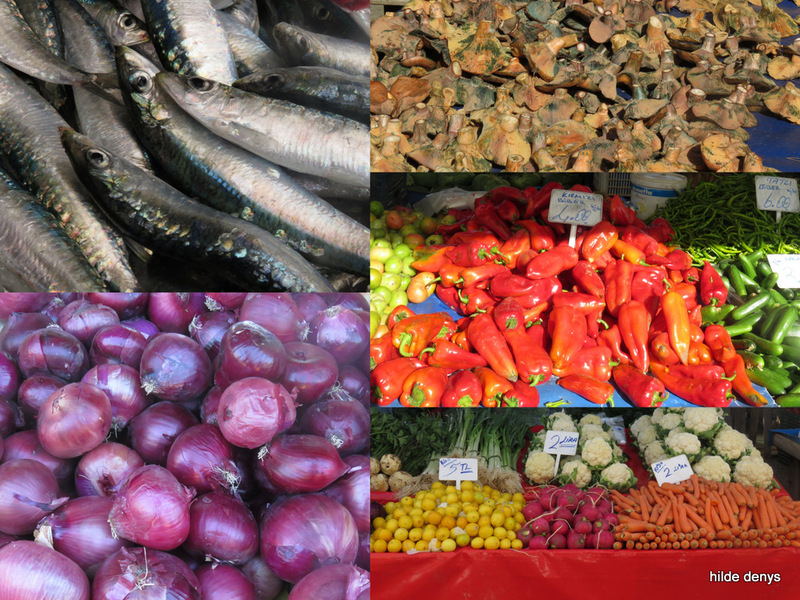 We will be leaving this Sunday, traveling north-west; I wont have much time to write and there certainly won't be time for designing or making jewels. Maybe I'll post some comments, journal like.